According to data assembled by the Uyghur Human Rights Project (UHRP) from research into Chinese and overseas media, a range of 656 to 715 individuals lost their lives in the violence that engulfed Uyghurs and other ethnicities between 2013-14. The number of fatalities in 2014 is approximately double that of 2013. Although these numbers should not be considered definitive, as the Chinese government tightly controls information in East Turkestan, they are indicative of deterioration in security conditions since Xi Jinping became Chinese president in early 2013. There were 125 incidents overall from 2013-14, 89 of these were violent. UHRP selected incidents interpreted as “political” in which Uyghurs were killed, injured or arrested. Uyghurs were three times more likely than Han Chinese to be killed in the violence. The south of East Turkestan, a Uyghur majority area, was most heavily impacted. Kashgar Prefecture experienced the largest number of fatalities. Of the 327 deaths in Kashgar Prefecture, 199 occurred in Yarkand County. Aksu (79 fatalities) and Hotan (76 fatalities) recorded the second and third highest number of deaths among prefecture level administrative areas. In a troubling number of incidents police killed all alleged “perpetrators.” The possibility exists that excessive force and extrajudicial killings are a feature of the Chinese state’s security approach to incidents. In addition, a number of incidents recorded by UHRP appear to have been provoked by heavy-handed, or at best insensitive, policing. UHRP condemns terrorism and advocates for a peaceful resolution to the legitimate political grievances of the Uyghur people. UHRP recognizes that some incidents occurring during the 2013-14 period appear to be premeditated attacks and unequivocally condemns these acts. Due to China’s tight control of information, the extreme lack of transparency surrounding incidents of violence should cause alarm among independent observers. Incidents such as the one in Alaqagha merit further investigation, as do credible allegations of state violence in Hanerik and Siriqbuya. China has not only deliberately obscured incidents of state violence against Uyghurs from outside scrutiny, but also it has not offered a full account of the causes for the violence. 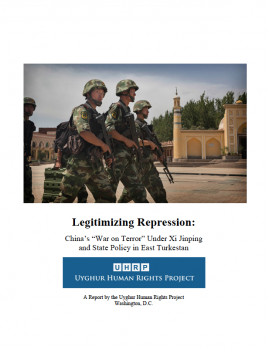 UHRP has identified Han Chinese migration, economic discrimination, restrictions on Uyghur identity, such as religion, and intensified political repression, including curbs on freedom of speech and information as contributing factors to the growth of tension in East Turkestan, especially in the south of the region. Chinese officials have not publicly questioned the consequences of repressive policies and provide no forum for Uyghurs to hold policies and officials to account. Through “counterterror” measures ostensibly aimed at controlling “religious extremists,” China has effectively silenced peaceful Uyghur dissenters to repressive Chinese policies. As a result, Uyghurs have been left with no explicit voice to change policy at a time of inequitable political, economic, social and cultural transformation in the region. Legitimizing Repression records fatalities, injuries and arrests occurring from “political” incidents breaking down such numbers by ethnicity and status (civilians, “perpetrators” and state actors). UHRP examines the spatial distribution of incidents by prefecture and county, as well as notes any chronological trends during the two years under review through month-by-month analyses. In discussing the findings of UHRP’s report, it should be noted that behind the data are individuals, families and communities. The statistics referenced throughout the report on fatalities, injuries and arrests all have a human face and it is important to remember the devastation violence causes to innocent lives.